Mechanical and electrical systems act as vital organs to a hospital, providing power, water, fresh air and other important elements that keep the hospital running efficiently and safely. Keeping those systems healthy is an essential part of being a health facilities manager. However, it can be challenging to stay up-to-date with the requirements and developments of hospital mechanical and electrical systems. Health facilities managers can find detailed guidance on these issues in the latest editions of the Mechanical Systems Handbook for Health Care Facilities and the Electrical Systems Handbook for Health Care Facilities. The key issues covered in depth in these American Society for Healthcare Engineering (ASHE) handbooks will give health facilities managers a solid foundation in these systems to meet the special needs and functions of their facilities. Proper construction and maintenance of mechanical systems, primarily heating, ventilation and air conditioning, are essential to the health of a hospital. Because of infection control, patient comfort, environmental concerns and other factors, mechanical systems in hospitals must be designed and maintained at a higher standard than those in a typical building. In recent years, another essential mechanical systems issue has moved to the top of priority lists for facility managers: energy efficiency. Codes issues. Mechanical systems in health care facilities are regulated by standards established by a number of organizations, including the Facilities Guidelines Institute, ASHE, the American Society of Heating, Refrigerating and Air-Conditioning Engineers (ASHRAE), the American National Standards Institute, the National Fire Protection Association (NFPA) and others. Chapter 7 of the Mechanical Systems Handbook provides a list of major codes to guide facility managers, and Appendix A-1 is a front-end project report that helps facility managers to prepare for inspections. Energy efficiency. An entirely new chapter in the Mechanical Systems Handbook, called “High-Performance Design and Operation,” spells out key design issues regarding efficiency. A first step in creating an energy-efficient hospital is to benchmark energy use. One tool to use is ASHE’s free Energy to Care benchmarking program that works with Energy Star Portfolio Manager and provides helpful data in graphic format and trend information. Energy to Care also includes an award program for ASHE members to recognize hospitals that have reduced energy consumption. Other aspects of energy efficiency include measurement and verification. Metering can be added to such mechanical systems as cooling, heating and domestic hot water, and to electrical systems like HVAC loads, plug loads and lighting to direct efforts to reduce energy consumption. Energy conservation specific to HVAC is highlighted in Chapter 8. Because patient comfort is a top priority in hospitals, energy conservation in HVAC sometimes takes a back seat. But Holdaway notes that properly scheduled maintenance does not need to interfere with patient comfort. Powerhouse equipment. 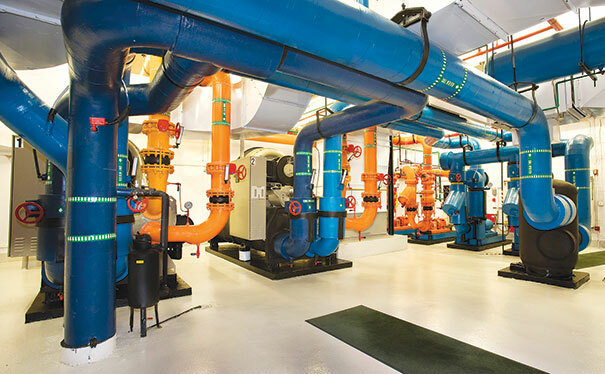 Powerhouse equipment is the primary heating and cooling equipment in a hospital. The equipment — boiler, chiller, etc. — likely was installed when the hospital was built, but facility managers should be aware of new system options, maintenance issues and code requirements. An important powerhouse maintenance issue is proper chemical treatment of water in the cooling tower, which extends the life of the tower and maintains efficiency. Another water treatment issue that facility managers must understand is minimizing the growth of Legionella in the cooling tower and the rest of a building’s water system. The handbook references a new ASHRAE publication, 188P, which requires hospitals to establish a formal program to minimize Legionella. Heating, ventilation and air conditioning. HVAC, and air handling systems in general, play an important role in hospitals. Indoor air quality is essential to the comfort of patients, employees and visitors. To properly understand HVAC principles, facility managers should have a basic understanding of the first two laws of thermodynamics, Holdaway says. The next step in managing HVAC is understanding psychrometrics, the dynamics of moist air. Appendix A-3 of the Handbook provides example psychrometric problems to help facility managers understand the use of a psychrometric chart. Testing, balancing and adjusting the HVAC are other essential roles of facility managers. This work should be handled by certified contractors after a major construction project, but in-house staff can do the work after minor projects. Chapter 10 includes a guide for basic procedures in this regard. Another important issue that facility managers should understand is commissioning, which is found in Appendix A-4. ASHE has several publications available on commissioning health facilities, including the Health Facility Commissioning Guidelines and the Health Facility Commissioning Handbook. Electrical systems control nearly every aspect of a modern hospital, and a knowledgeable facility manager recognizes the interconnectedness of electrical systems and their energy sources. A hospital’s electrical system must provide reliable, disturbance-free power around the clock. Furthermore, it must be exceedingly safe, because patients are often in vulnerable states. All of this must be accomplished according to overlapping regulations from national and local authorities. Standards and codes. Anyone dealing with electrical systems in a hospital must have a basic understanding of the plethora of standards and codes affecting the field. Depending on the hospital, standards that must be followed include those adopted by state and local health departments, the Joint Commission and the Centers for Medicare & Medicaid Services. Typically, authorities reviewing the design and construction of health care facilities use codes established by the NFPA, including NFPA 70: National Electrical Code; NFPA 99: Health Care Facilities Code; NFPA 110: Standard for Emergency and Standby Power Systems; and NFPA 111: Standard on Stored Electrical Energy Emergency and Standby Power Systems. Overcurrent protection. A facility manager must understand the basics of protecting against “faults,” which are open circuits, unintended grounds and short circuits. The equipment that protects against faults includes circuit breakers, fuses and ground-fault protectors. Every hospital should undergo an evaluation to ensure that overcurrent protective devices can handle the highest possible faults. Arc flash and selective coordination. Arc flash and selective coordination are related to overcurrent protection, and a new chapter of the Electrical Systems Handbook specifically addresses this topic. Arc flash and selective coordination are closely related. Selective coordination of overcurrent devices is generally desirable, because it ensures that the smallest area of a facility will have its power interrupted when a fault is cleared. But selective coordination means there is a time delay in tripping the circuit breaker, which increases the arc flash incident energy and the resulting risk. To limit the risk of arc flash, managers should know the basics of reducing the incident energy of the arcs — by reducing the magnitude and time duration of the arc current — and understand the importance of distance and PPE in reducing the physiological effects of arc flash. Essential electrical systems. Naturally, the electricity supply in a hospital must be reliable, and NFPA codes specify a number of requirements, including the installation of automatic transfer switches and the presence of multiple branches to separate loads by type. Facility managers should be aware of the different types of acceptable generators, how they are fueled, and the basic operational procedure. A section about ground-fault interruption explains that such protection was prohibited for standby generators by previous editions of NFPA, but the larger sizes of health care generators, especially paralleled sets of generators, led the NFPA 70 committee to make ground-fault protection optional. Patient safety. Keeping patients safe from electrical shock is generally accomplished by grounding metallic surfaces that are likely to become energized, and by protecting people from energized parts. Facility managers should be aware of NFPA requirements, such as the use of isolated power systems as alternatives to ground-fault interrupters in wet locations, and the specific requirements for operating rooms. Lighting. Requirements for lighting in hospitals vary widely, because these facilities contain offices, public spaces, sleeping quarters, work areas and many other spaces. Lighting in patient care areas should be cleaned frequently and have minimal crevices or cracks, which can trap infectious material. Operating rooms have specific lighting needs; for example, computer monitor glare must be carefully controlled. The latest edition of the Electrical Systems Handbook is the first to discuss LED lighting, which efficiently provides quality light for many conditions. Maintenance and testing. Maintenance and testing are critical for hospital electrical systems, but they need to be tailored to each facility. NFPA codes applicable to testing and maintenance recently have changed to emphasize customized maintenance. Among the basic concepts that apply to all health care facilities are the recommendations to create a one-line diagram that shows the connectivity of the electrical system and an equipment-labeling protocol that indicates voltage, location and other information. www.nnsi.net Back up Power and Cabling solutions for Health Care Facilities.